Johanna Pirker is game developer, researcher, and educator, and an active and strong voice of the local indie developer community. She has long-lasting experience in evaluating, designing, and developing games and virtual realities and believes in them as tools to support learning, collaboration, and to solve real problems. In 2011/12 she started developing virtual worlds for physics education at Massachusetts Institute of Technology. Johanna has started in the industry as QA tester at EA and still consults studios in the field of games user research. 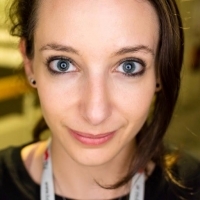 At the moment she teaches game development at Graz University of Technology and researches games with focus on HCI, AI, UX, and VR technologies. She is organizer of the annual game developer event gamedevdays.com and is currently working on the project ayearofplayingtheworld.com Johanna is listed as a Forbes 30 under 30 honoree in the science category.